Category Archive for "Mental Health"
The new paper identifies the health system barriers leading to low rates of utilization of mental health services among internally displaced people (IDP) with mental disorders. 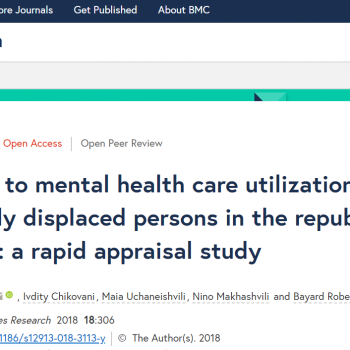 The paper was published in BMC Health Services Research authored by Adrianna Murphy, Ivdity Chikovani, Maia Uchaneishvili, Nino Makhashvili and Bayard Roberts. 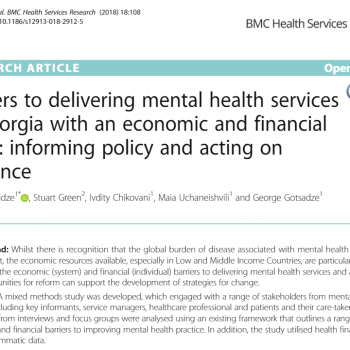 A new paper discusses the economic and financial barriers to delivering mental health services in Georgia and assessing the opportunities for reform that can support the development of strategies for change. Per capita expenditure on the mental health in Georgia significantly differs from that of the countries with the similar development level, where more money is spent on mental health services.